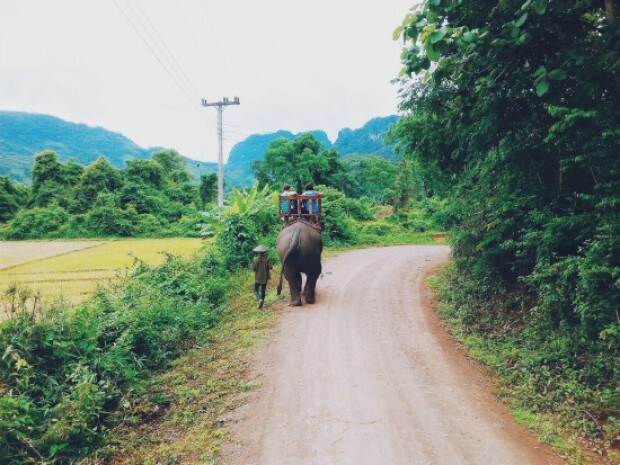 If you haven't been to Luang Prabang, here are reasons to convince you to visit it now. Contributed by Life Without A Compass. Luang Prabang is not a place you come to ‘just visit’. Small, perfectly formed, and with an unmistakably pervasive charm, this undisputed Crown Jewel of Laos has gone – in less than two decades – from being one of the most underrated cities in Southeast Asia, to become a thriving destination firmly entrenched on every traveller’s Southeast Asian trail. And yet, amidst its rising popularity, the magic of this beautiful heritage town still remains largely undiminished, its natural splendour fully preserved in charm and history. 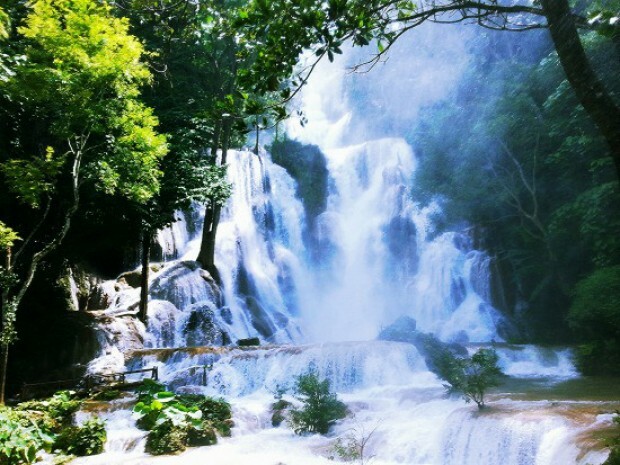 Cascading waterfalls, scaling peaks, caves, and the milky-brown waters of the Mekong and Nam Kha Rivers: the fundamental allure of Luang Prabang is worth centuries in age and yet still very much in tact for the traveller looking for a respite from the hotfooted bustle of today’s shrinking, fast-paced world. The curiously eclectic combination of royal palaces and Wats, together with its rows of quaint shophouses and sidewalk cafes, makes this the perfect truce from life’s constant mad rush: if you need an express serving of spiritual contemplation and inner peace, then this is your best shot. If you’re lucky enough to visit, you’ll understand fast enough why Luang Prabang is arguably one of Southeast Asia’s most beautiful and least commercial travel destinations to date. And while it is no longer a best-kept travel secret, the reasons to fall in love with this resplendently preserved city remain, by and large, fairly unchanged. Laos may strike some as a travel nightmare: it is by no standards a glitzy metropolis; the roads are a potholed mediocrity; there is a nationwide midnight curfew; and there is a severe lack of an authentic food culture – or any culture, that is. In fact, if this is the last stopover in your Southeast Asia turbo-tourist route, you’ll probably be inclined to dismiss the entire landlocked nation as an insipid blend of Thailand, Vietnam, and Cambodia all rolled into one. And yet, when you speak to anyone else who’s ever been through South-east Asia, they will all tell you the same thing: Laos is the most amazing one of them all. It can’t be the sights (UNESCO certified it may be, but surely the likes of Cambodia and Vietnam hold stronger, more poignant attractions); it can’t be the scenery (if you’ve been to any of Thailand’s beaches or islands, you’ll hardly be blown away by Luang Prabang), and it certainly can’t be the food (there isn’t much of any). Which then leaves us with only one plausible explanation. 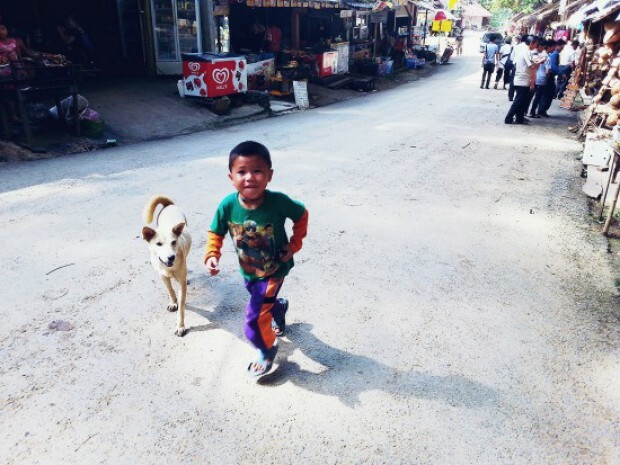 Laotians are generally the friendliest, gentlest, most hospitable people you’ll ever meet; but in Luang Prabang, they somehow take this disposition to a whole new level. Don’t expect hugs and kisses all round – they’re not that kind of friendly – but they’re warm, polite, genuine, and non-confrontational; and their extra idyllic, laidback way of life has a way of drawing you in to never want to leave. 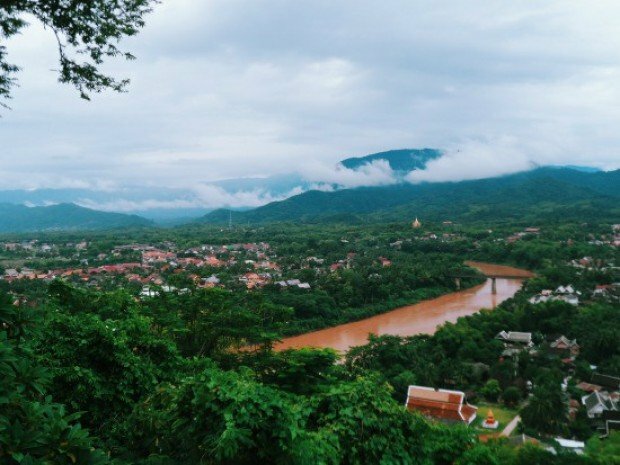 In Luang Prabang, it won’t be difficult to find travellers who’d initially planned to spend just a day or two here, only to end up extending their stay to three days, and then four. It isn’t hyperbole: the magnetism of Luang Prabang is indisputable. And so is the homespun gentility of its people. As you will learn, the time-stopped quality of Luang Prabang is a rare commodity in Southeast Asia that is not only refreshing, but also an extremely welcoming change – especially if you have been jetsetting your way across the likes of Thailand, Vietnam, Cambodia, or more. For some reason, Luang Prabang seems to have missed out on the rapid wave of development that has been sweeping across Southeast Asia for the past two decades; and while this retardation often almost always spells doom, Luang Prabang has somehow managed to grab this shortcoming by the horn, own it, and work it like a charm. Surrounded by mountains and waterfalls with towns of worn timber houses, crumbling colonial architecture, and glistening temples and monasteries, there is a bizarre sense of freedom and inner peace that comes from being in this backwater destination. Take a tour around the temples, participate in an alms-giving ceremony, and shop at both the morning and the night markets: the many ways to soak in Luang Prabang’s unique atmosphere are endless. It puts you in touch with a simpler, untroubled way of living, and you’re immediately made to feel like you’re part of its harmonious zen. Squawking bikes and tuk-tuks aside, being in a Luang Prabang feels like a travel back in time, and is truly the one exclusive snapshot of life lived without all the complications and distractions of the modern world. There is something decidedly surreal and almost mythical about Luang Prabang’s landscape that makes it the mother of all daydreaming ideals. Its untainted mountainous surroundings come with its own scenic ensemble of breathtaking waterfalls, meandering trekking trails, elephant camps, enchanting river cruises, and more; creating a delightfully provincial demeanour backed by a spectacular hodgepodge of picturesque elements. 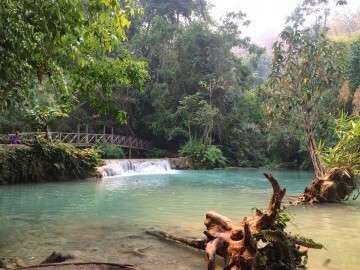 Specific sights that must not be missed include the Kuang Si Waterfalls, a three-tiered, 50m drop waterfall that comes with stunning turquoise pools that cascade down layers of limestone formations; and the Pak Ou Caves, cut amidst the crevices of pocked limestone cliffs located high above water. Scenery junkies will also want to take on the climb to the top of Mount Phousi, a spiritual summit located 150m above ground, offering a 350-degree outlook on Luang Prabang’s charmingly quaint countryside setting. And yet, still, cynics will be quick to argue about the lack of headline-worthy locations and attention-grabbing attractions in comparison to its neighbouring counterparts. 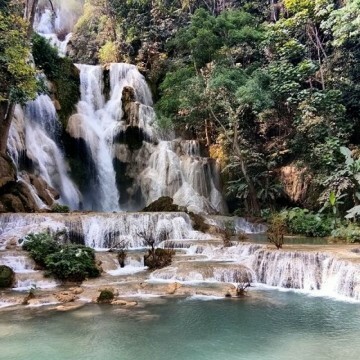 But that is Luang Prabang for you. There is nothing glamorous or jazzy about this backwater town that could possibly lure well-heeled travellers away from the gloss of cosmopolitan glitz; and even then, rarely will you come across anyone who passed through Luang Prabang and didn’t leave a piece of themselves here. Perhaps then, the key to understanding – and ultimately falling in love with – this former Royal Capital has nothing to do with the palpable, and everything to do with its enthralling atmospheric appeal. After all, this isn’t a city of theatrics, and little effort is put into hyping up anything. Here, you have to spend time to get it. Because what it lacks in showmanship – as you will discover with each passing day – it more than compensates with its magic. 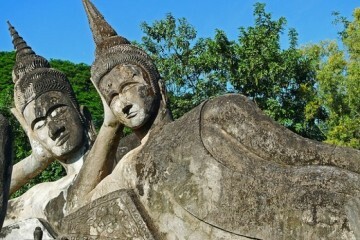 Enjoy Luang Prabang. Because I know I did.